I remember it used to be challenging to make a good calendar icon, but somehow these days a white box with a red top (with option day-of-month inside) suffices. I wonder what really made that happen? I was delighted that my new job has a developer culture that favors IntelliJ IDEA: it is a much easier to use and generally smarter product than Eclipse. I'm not going to make a point-by-point comparison, but believe me when I tell you I've met a dozen people who say IntelliJ is their strong preference over Eclipse, and zero who know both who say the opposite. Worked great! I selected cmd-1 as my easy to remember, not otherwise useful key combo, and now my life is better: cmd-s, cmd-1, cmd-tab (to browser), shift-cmd-r (reload). (or just shift/click-reload-button) Much faster than having to use the mouse, and my fingers got tuned to it pretty quickly. Here is a link to the main webpage. So Apple dropped the ball, or at least confused the hell out of me. 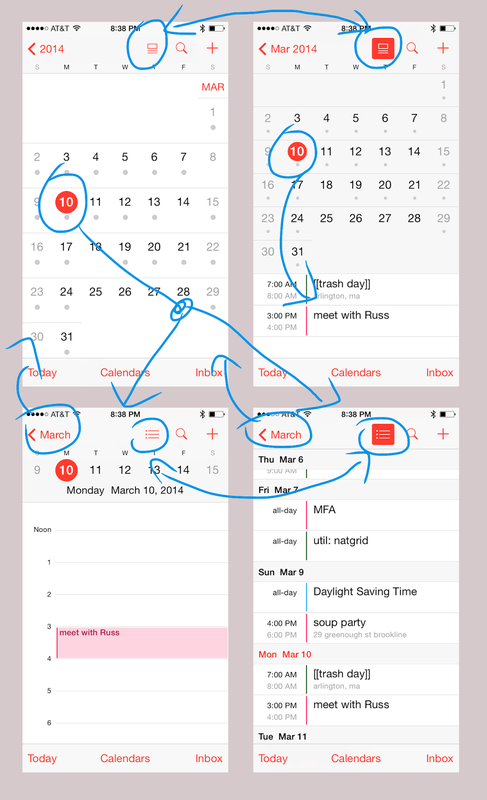 I could only get a "month list" view; a list view of a day's events underneath the month grid. No matter what I tapped or swiped or held, there was no way to see a simple list of events for multiple days. Sites describing the new 7.1 features in detail talked about this view, but getting there proved a mystery! Similarly, my friend Diane was complaining how the update didn't include a "month list" view. Clicking on a day on the month grid just zoomed in on that day... checking multiple days then required bouncing back and forth. State machines can be very useful for programmers, but they should be easier for your users to mentally model than this! I wanted to find out the RGB value of some pixels on an image. 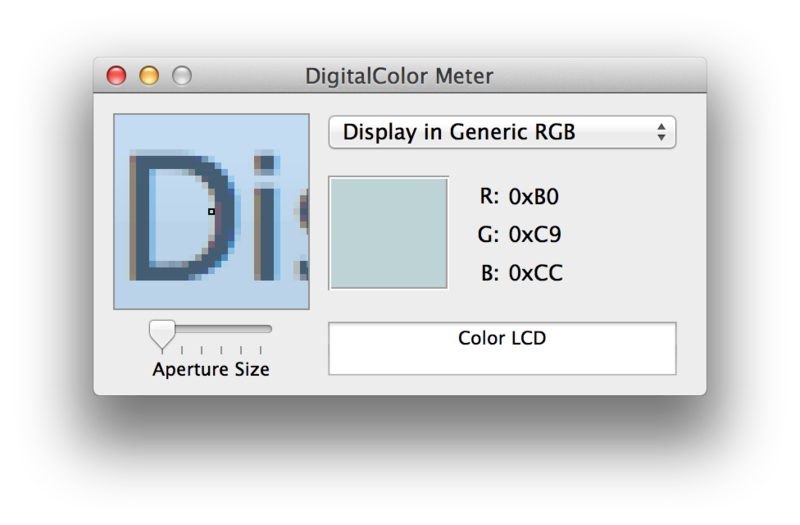 Turns out OSX has a "DigitalColor Meter" built-in. (Just hit cmd-space and type DigitalColor). Under its View menu, you can "Display Values" as hexadecimal, which is often useful for web work.